Jamal S Khalil, General Manager, of Al Rafedain Marine Services signed the documents on the Palau stand at STMM to register two ships and was supported by International Shipping Bureau (ISB)-Dubai, one of the valued Deputy Registrars of PISR among a network of 39 DRs in 24 countries, which helped facilitate the new signings. “This is yet another example of how far Palau International Ship Registry has come in such a short few years. From being the newest registry in the industry just over five years ago, we are now recognised as the fastest growing flag and also as a SMART registry. Having Al Rafedain Marine Services and their vessels as part of the Palau fleet means we are increasing our services in the shipping sector. Our relationship with our agents, registrars and maritime consultants such as ISB means we have an even greater presence in the maritime world. We work closely with our Deputy Registrars and ISB has been a valued and reliable one for PISR. 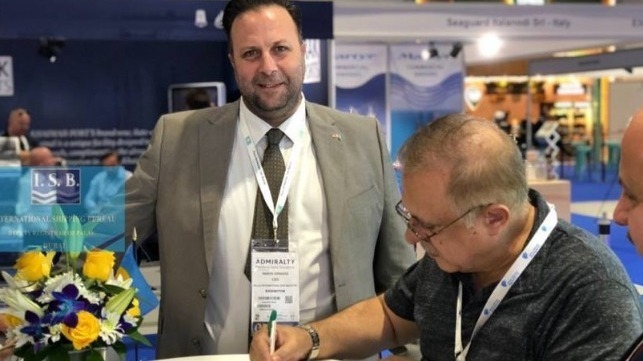 Their connections and clients have been developed over many years because of their experience, knowledge and commitment and at Palau International Ship Registry we are delighted to work with them in maritime matters.